Trustworthiness, respect, diversity, learning and teamwork are the hallmarks of Duke's guiding principles. Our accomplishments are dependent on the dedication and expertise of all who work to support Duke's mission. 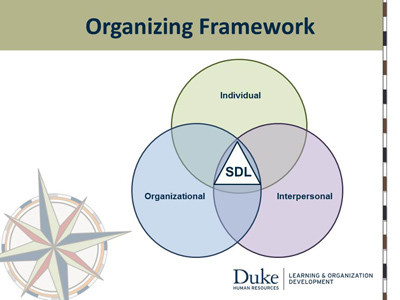 The Duke Leadership Academy curriculum is based upon best practices from Fuqua/COLE Leadership Model, and management and leadership styles and behaviors. The program is highly interactive and provides opportunities to discuss leadership principles and experiences with senior leaders and then apply the learning to current organizational challenges. Learning will be in the form of classroom education, 360 assessment, and coaching to help leaders make significant differences at Duke. The Duke Leadership Academy is partnering with the Fuqua/Coach K Center on Leadership & Ethics (COLE) to provide leadership development best practices for Duke University’s academic and administrative leaders. Through this dynamic partnership, the leadership academy leverages the intellectual resources and practical experiences of leaders to support excellence, innovation, and continuous improvement at the individual, team, and organizational levels as it focuses on effectively recognizing, developing, and retaining talent. Central to the Academy curriculum is the Organizing Framework, a model for exploring key aspects of leadership at the Individual, Team and Organizational level.